The federation of Denmark will host the major handball event. On the second day of the 10th Ordinary EHF Congress in Copenhagen, Denmark, the two applicants for the Men’s EHF EURO 2014 European tournaments – Croatian and Hungary in a joint bid and Denmark – were given the opportunity for a presentation of their bid. The presentations were followed by the voting procedure involving all the federations. 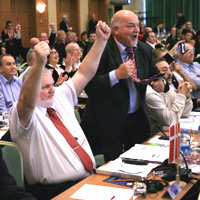 The vote ended 51,1% to 46,8% in favour of the federation of Denmark. Denmark received 24 votes, the joint bid of Croatia and Hungary received 22 votes, and there were 3 abstentions. Find all details on the website dedicated to presenting the bid. As both candidates Slovenia and Turkey withdrew their application, the awarding right goes back to the EHF and new bidding has launched.